The 4001 Guillotine Shears are classic guillotine style bench shears that offer the precision, flexibility and ease of use required by the most demanding operators. The 4001 has been strengthened to enable it to cut .080" aluminum and other heavy materials. ● Use of steel. All aluminum has been removed from the cutting action of the shear. In addition the end plates of the shear now are made from plate steel. ● Strengthened upper blade guides. 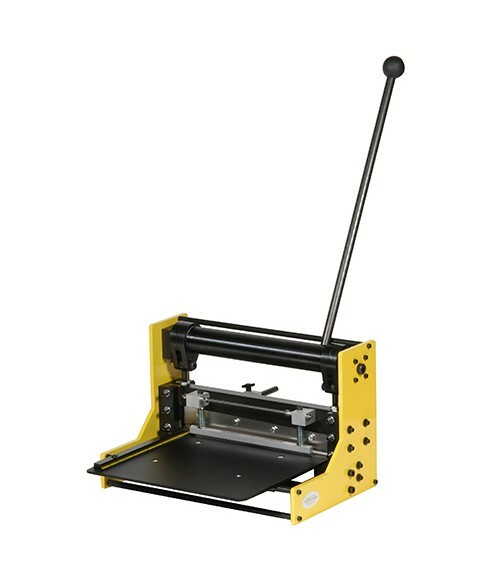 The front and back upper blade guides are machined as a unit from a single piece of steel. ● Vertical blade attachment. Both the top and bottom blades are mounted vertically which is the strongest position. They are also set in milled pockets that provide a flat mounting surface and support the top edge of the blade. ● Interchangeable blades. The top and bottom blades for metal are identical. ● Top blade adjustment. Many heavy duty shears require that the frame be loosened in order to adjust the bottom blade. On the 4001 the bottom blade is in a fixed position. As a result, the 4001 shear frame does not need to be loosened to adjust the bottom blade and remains tight and adjusted. The top blade is adjusted by the use of pressure plates on the front and back of the top blade holder. ● Aluminum Bronze pressure plates. The four pressure plates that are used to align/adjust the upper blade are made from an aluminum bronze alloy that has great resistance to wear and abrasion. ● Oil impregnated bronze bushings. The main pivot points of the shear action have oil impregnated bronze bushings for long wear and ease of maintenance.